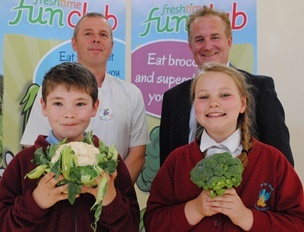 They are the first ever members of the Freshtime Fun Club, a new project to encourage healthy eating and teach Lincolnshire children about the food that’s grown on their doorstep. 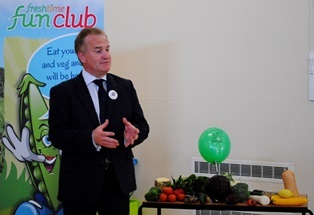 The project was launched on Friday 9th May at Boston West Academy by Freshtime, the leading Boston-based snack salad and vegetable specialist. 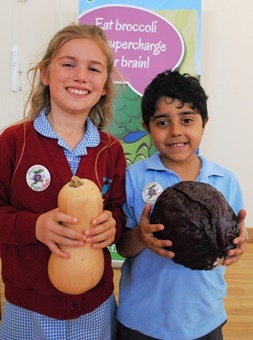 Around 240 pupils at the school were enrolled in the Freshtime Fun Club as part of a whole term of vegetable-related activities. 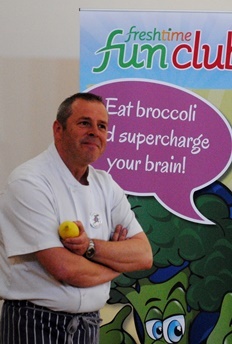 Development chef John Kermode was on hand with a basket full of vegetables to test the children’s knowledge, from tomatoes and cabbages to less familiar varieties such as moolis, purple carrots and yellow courgettes. 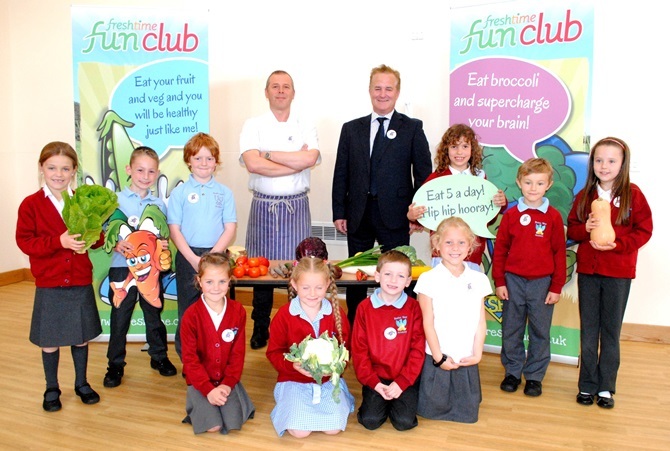 Freshtime is providing the children with regular snack packs of fresh vegetables throughout the term and members of the Freshtime Fun Club receive balloons, bookmarks, badges and a monthly activity sheet. The firm is also donating equipment for the school’s allotment and polytunnel and on 19th June younger pupils will make a visit to the factory on Marsh Lane in Boston to see salads, snacks and meals being prepared. Later that day older pupils will take part in a Dragon’s Den style competition and pitch recipe ideas to a judging panel including Freshtime’s Managing Director Mark Newton. “The children really enjoyed meeting the visitors from Freshtime – they bounced out of school with their gifts full of glee munching on their peppers!” said Emma Schofield, Outdoor Learning Leader at Boston West Academy. 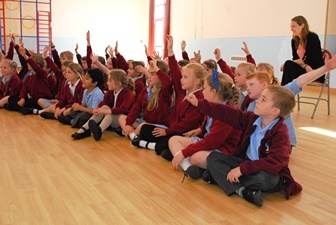 Freshtime MD Mark Newton, who visited the school for the launch on Friday, said: “It was wonderful to meet such an energetic and knowledgeable group of children and to fire their enthusiasm for the activities we’ve got coming up this term.